Did Arvind Kejriwal Say ‘We Are Ready To Support Congress’? 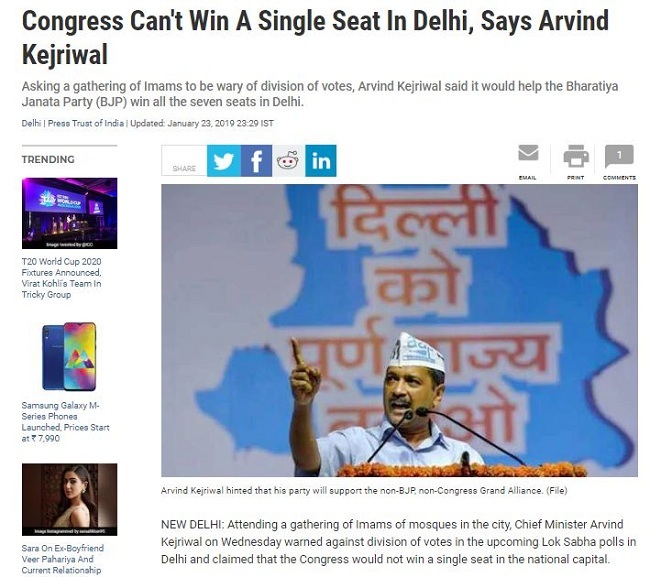 Contrary to what ShankhNaad’s post claims, Arvind Kejriwal said Congress would not win a single seat in Delhi. A video claiming Delhi Chief Minister Arvind Kejriwal said the Aam Aadmi Party (AAP) was willing to support the Indian National Congress (Congress), is misleading. A line from Kejriwal’s speech at a gathering in the capital last week, has been culled and shared without context. 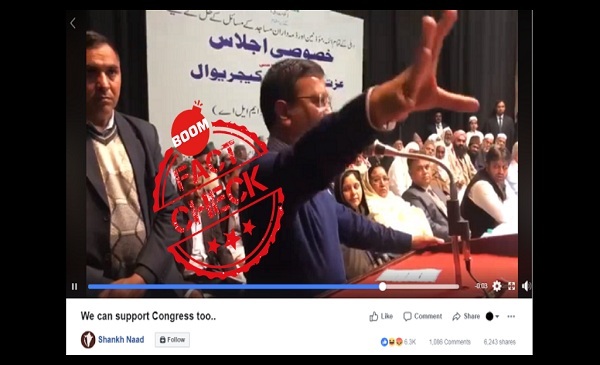 The video clip has been culled from a speech made by Kejriwal at a gathering of Imams of mosques in Delhi on January 23, 2019. The event was hosted by the Delhi Waqf Board. Contrary to what the post claims, Kejriwal said he did not expect Congress to win a single seat in Delhi and warned against the division of votes in the upcoming Lok Sabha polls. Kejriwal’s speech was accurately reported by the Press Trust of India on Wednesday in its story – ‘Congress Can’t Win A Single Seat In Delhi, Says Arvind Kejriwal’. Below is an excerpt from PTI’s story. Read PTI’s story here. BOOM was also able to find another video on YouTube of the same speech taken from a different angle. It was uploaded online on the same day the event took place. Watch the below video from 3 minutes and 11 seconds. Arvind Kejriwal explains the electoral math stating in 2014 Lok Sabha polls the Bharatiya Janata Party got 46% votes, while AAP got 33% votes and Congress 15% votes in Delhi. All the pre election surveys are claiming BJP will lose 10% votes, Kejriwal says. And even if these 10% votes go to Congress, BJP will still win seven seats in Delhi but if these seats go to AAP then AAP will win all seven seats, he explains. The part about giving Congress seven seats to contest comes at 5 minutes and 20 seconds in the video. Kejriwal’s comments about Congress not being able to win a single seat in Delhi has been left out of Shankh Naad’s video. Despite Kejriwal’s comments, an alliance between the bitter political rivals has long been speculated and recently got fresh legs after AAP MLA Amanatullah Khan was reported to have said that AAP would support Congress if the next prime minister came from party. Claim Review : Arvind Kejriwal said AAP is willing to support the Congress party.